Breakfast is said to be the most important meal of the day but for many persons it is often nothing more than a slice of toast, orange juice, or cereal and milk. 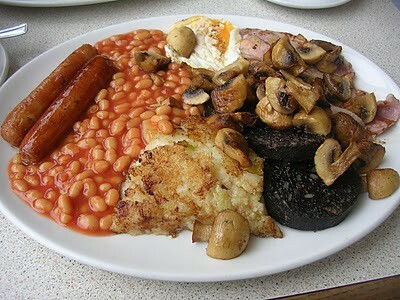 The traditional English breakfast is a deviation from that. The meal is extremely popular in the United Kingdom and Ireland appeals to middle and upper classes and is designed to keep you full. The breakfast is considered a staple of English cuisine and is served in hotels, airports, and restaurants during the week or weekends at bed and breakfasts and is also often served in pubs as an all-day breakfast. Breakfast suggests early morning but the meal is also popular at other times of the day. The breakfast consists of grilled sausages, bacon, tomatoes, eggs which can be done in a variety of ways including poached, scrambled or fried, baked beans, bread, and hash browns. Some recipes include black pudding. Start by grilling or frying the sausages. While the sausages are being prepared put the bacon and tomatoes on the grill cooking at medium heat. The tomatoes should be cut lengthways and sprinkled with salt. Cook mushrooms in a separate pan in chicken stock for 10-15 minutes. Leave the eggs until last. Leave the other items in a warm oven in the meantime. Arrange everything on a plate. Serve and eat. The breakfast can be taken with a cup of tea or coffee.